Walk out of the MRT station, cross the road and walk along the park on your right, up the hill. 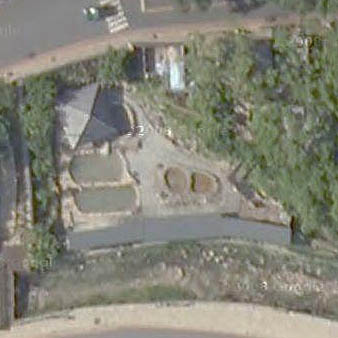 Just past the Japanese hot spring museum are the public baths (also on your right). 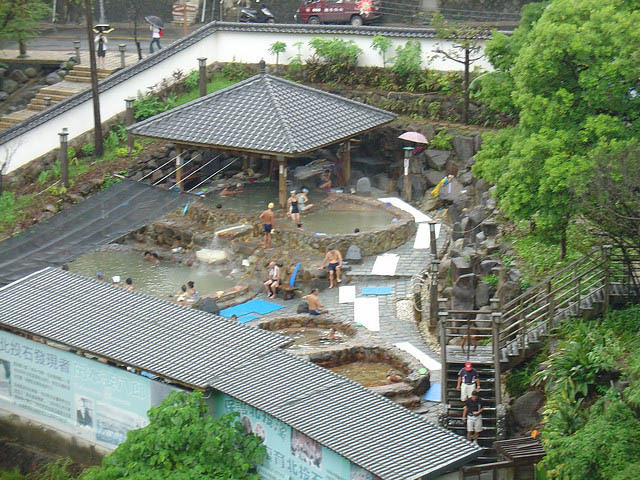 There are 3 small pools, filled with senior citizens and tourists as well as the spring water, which reaches about 43 degrees. The atmosphere here is lively and friendly so it's more fun than relaxing. But, It's really cheap, and costs only 40NT ($1.30) to get in. The best time to go is weekdays, during the day as there won't be many people. You have to bring your own towel, swimming costume and cap (if you want to put your head underwater, or have long hair). Every two hours the Xinbeitou public baths close and everyone has to leave while they do a bit of cleaning for 20 minutes. Before you pay and go in, check the signs next to the entrance to make sure they won’t throw you out after 15 minutes. There is also an over-zealous, but kind hearted guard who pounces on anyone who breaks the endless rules here. You are not allowed to sit in the pool with only your legs. You have to go in full body. Apparently this has something to do with circulation because you might pass out or get dizzy if you only dip your feet.